There are two main parenting choices I’ve made that have sent many in an uproar. They have been the impetus of countless parenting debates and have left opposing sides—after they have finished unleashing their fury—begrudgingly resolving to agree to disagree (glints of disdain in all eyes). Neither willing to see the others point of view and having an answer for every question, the issue never gets resolved. However, this other controversial choice that I’ve made, has been what, parents have, in so many words, described as being the root of all evil for girls. It will apparently lead them into a life of vice and shame. This thing, that I’ve been given so much grief over for allowing Kamryn to do, has been—wait for it (puts on helmet and takes cover under desk) —allowing her to wear nail polish! Boom! Now let me just say that when my sister and I were growing up, we were only allowed to wear nail polish on very, very special occasions—when we left the country…and we only did that once (on our first and only trip to Jamaica when we were about seven and five, respectively). I remember the color we chose…fire engine red! Our aunt painted it for us, amidst open suitcases and wrapped trinkets for relatives we had never met, on the day before we were to leave. But besides no watching of television on school days, (except ABC’s TGIF lineup that included, Perfect Strangers, Family Matters, and Step-by-Step…any 80’s babies out there? ), we weren’t allowed to swear or waste food, we had to say our prayers each and every night, and we were not allowed to wear nail polish…unless, as stated before, we were traveling to see very, very distant, never-before-seen…or spoken to, relatives. Now fast forward some twenty-plus years, and I’m now the parent, who, for some time, implemented the same “no polish” rule in my household. Whenever Kam saw me rifling through my impressive collection of polish, indecisive of which color mood I was in (was I feeling for a cunningly coral hue, or was it going to be a subtle navy blue kind of day?) her eyes would light up and then instantly dim when she met mine and heard my response. I would tell her she was too young, and had to wait until she was at least 13 before any color would ever grace her tips. She would whine and complain but I was stern in my ruling. And then…for her fifth birthday…all of that changed. I took her to the hair salon, bought her a white fluffy bear with pink ears at Build-A-Bear (who she later name Rosie) we chowed down on some Spinach and Artichoke dip (our fav!) at Applebee’s, and then I thought, why the heck not…it would be fun! We then made our way to the nail salon. However, I had my restrictions. I have always cringed when I saw little girls with painted finger nails. I’ve always thought it was highly inappropriate and they were much too young to be taking part in what should have been considered a rite of passage for girls older than they were. I have always vowed that if ever I had a daughter, I would never let her get her fingernails done. But the toes…well those were a different story. I’ve only ever allowed Kam to paint her toe nails. Seem pretty hypocritical, doesn’t it? Well my reasoning has always been that everyone should have pretty toes! What harm could a little varnishing of color on her little piggies do? Apparently a lot! In discussions I’ve had, parents have spat that it would lead girls to act more maturely than they are. Some have said that if they’re painting their nails at 6 and 7, then when the time rolls around for when they should have started painting their nails (12/13) then they will want to do the things that girls at that age will be looking to do (dating and such…ha! Yeah right not in my house!) or worse! Cries of ‘Let children be children!’ have been hurled at me. My response has been that I wholeheartedly respect and adore childhood and want my daughter to bask in all of its glories. I want her to have endless sticky summers of Tag and Red Light, Green Light, One-Two-Three. I want her to have a fearless approach towards everything, and not have a single care in the world. I want her big dreams to never become deflated. I want her to always dream. For that’s what childhood is all about! I tell these critical caretakers that I’m all about keeping my daughter innocent for as long as she possibly can be. I still leave cookies out for Santa and sneak to gobble them up before she awakes. I put crisp dollar bills under pillows and am as shocked as she is when her mini-molars are no longer tucked under her pillow. I don’t let her watch the news or mull over any impossibilities. I tell her there are none! So to parents who question the repercussions that await me after having my daughter paint her nails, I tell them that irregardless of how they make it seem, I highly doubt that allowing a child to wear nail polish, as sparingly as I do (I have only allowed Kam to paint her toenails on one or two birthdays and maybe once every summer…I also limit her color choice to kid-friendly colors). Although I don’t believe there have been any studies done, I highly doubt that the painting of nails at a young age will be the determining factor in who my child will become. To the parents who scoff and criticize me while Kam and I sit side-by-side on our meticulously planned “Mommy/Daughter Days”, I ask them how much time do they dedicate to spending meaningful time with their child or do they just allow Beyoncé songs and Nickelodeon to do the job for them? I tell them that a compilation of things can lead to a “destructive” child. You could be the “best” or worst parent. You could have been a stay-at-home parent who decided to quit their job so they wouldn’t miss any milestones, or a parent who worked 60 hours a week. You can hid cameras, activate GPS monitoring devices on cars, read diaries, eavesdrop on phone conversations, ground, put on time-outs, and even take away electronic gadgets. But when it is all said and done, we as parents are not our children’s ONLY influence. The painting of nails will not lead to prostituting on Pennsylvania Ave. Perhaps bringing every man around who said you were cute, smoking, cussing, or allowing them to watch any kind of rubbish on television will. Or maybe all of that won’t. All we can only ever do as parents is our absolute best in instilling all the best we can in them! 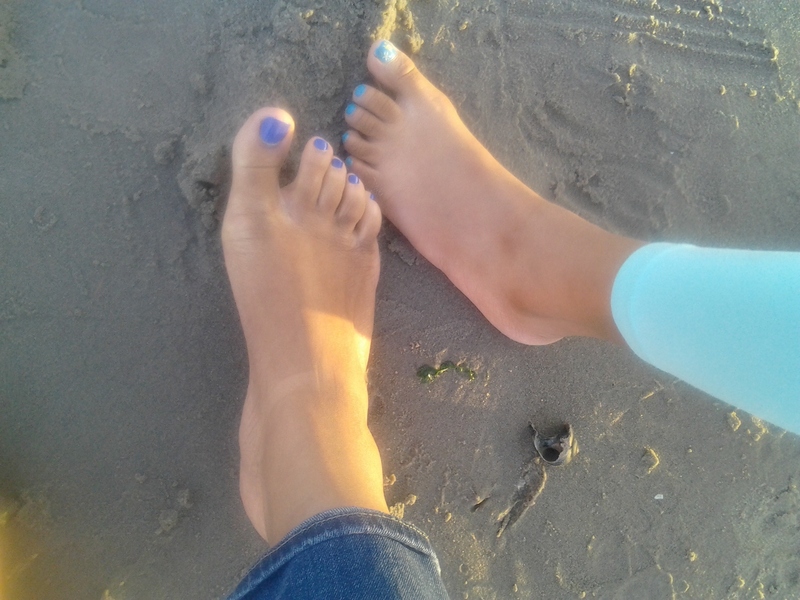 After the fact, I used to feel guilty about letting Kam paint her toes. I would occasionally not allow her to wear sandals for fear of what other parents would say, but now those fears of criticism have passed. She’s my kid, and I’m raising her to the best of my ability. I’m also confident that if I continue to instill in her the right morals and values, and put God first, I’m sure a little color on the end of her limbs won’t lead to a life of doom. My faith won’t allow me to believe that. It just won’t. So what are your thoughts? 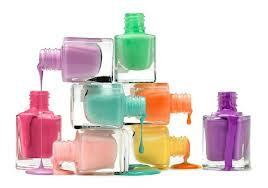 Is nail polish the root to all evil? To add to the discussion… Personally my daughter can’t stand the smell of nail polish and doesn’t even think twice about it NOW. But in the brief few years when she did show some interest in nail polish I always had some nagging voice in my mind of an auntie or grandma telling me that only prostitues wore red nail polish (which ended up making all NP frowned upon for young girls). It seems so foolish to me now. We all know what prostitues do and I wonder how many people are checking out their manis/pedis to test this theory. All in all I feel life is too short! Red nails for everyone!! Lol @ “red nails for everyone”. I agree. Why make something that is supposed to be taken in fun, a negative thing? I think its so funny that Jayda can’t stand the smell of it. But ur right…life IS too short, and we need to focus on bigger things, in the ways we are raising our children. Nice comment!